Make sure to use latest video card drivers. Faogen relies on some advanced GPU capabilities and some of the old drivers contain bugs in its implementation. 64-bit version require Windows 7 SP1. Setup program detects your OS version and installs x64 or x32 build automatically. 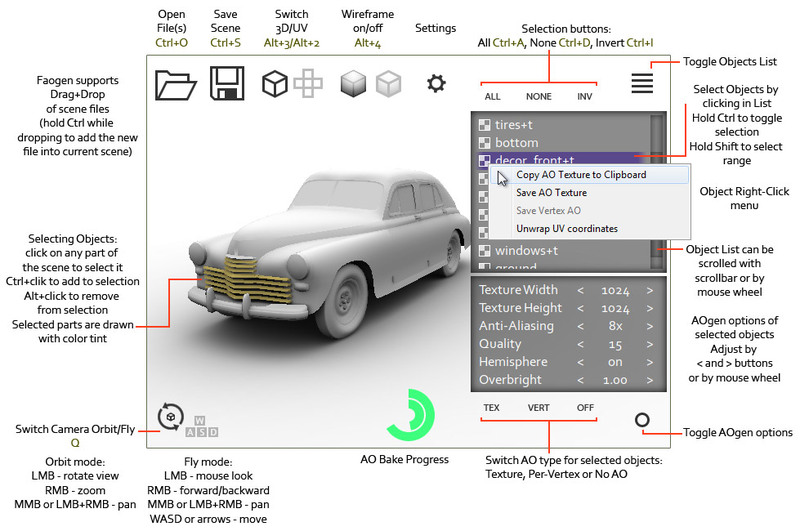 Faogen 3 loads and saves following 3D formats: Wavefront OBJ, Autodesk FBX, 3DStudio 3DS, Collada DAE and AutoCAD DXF. Baked AO textures can be saved as 8-bit PNG or TGA grayscale images. Future versions will include support for saving to HDR image formats. Also, AO texture can be copied to system clipboard and pasted directly into image-authoring program. AO can be baked into texture or into per-vertex color channel. Many 3d models contain symmetrical (or repeated) parts, which can share same UV coordinates to save texture space. Usually, baking of ambient occlusion (or any other surface parameters) into such textures produces unwanted artifacts when overlapped parts simultaneously write into same portion of texture. Faogen 3 adds special support for baking texture AO for objects with overlapping parts by averaging their input into final image. This skate model have left and right wheels and left and right trucks halves sharing same texture space. And baked result looks as good as with unique texture coordinates for every part of the model. FaogenBatch is a command-line utility for automating process of ambient occlusion baking. It is fully compatible with FaogenBatch from Faogen versions 2 and below so all exisiting scripts will work with new version. -i input filename. Can appear multiple times for mergeing objects from multiple files into one scene. -o output filename. If missed only generated textures are saved. -only define only-substring. Objects which names contain this substring will the only ones to be included for AO generation. Can appear multiple times. -skip define skip-substring. Objects which names contain this substring will be excluded from AO generation. Can appear multiple times. -overbright constant used to scale calculated AO. -gamma set AO gamma-correction power. For example: -gamma 2.2 sets power to (1/2.2). -hemiY use only top hemisphere for AO calculation. Y axis is UP. -hemiZ use only top hemisphere for AO calculation. Z axis is UP. -q quality. Controls number of iterations. -width width of generated AO texture. -height height of generated AO texture. -msaa anti-aliasing mode. 1, 2, 4 or 8. -unwrap unwrap UV coordinates before AO texture baking. -eflood maximum distance of edge flood post processing. -fao use saved object options preset from file. There is a maxscript file for automating per-vertex AO baking, see faogen_vertex_ao.ms file in Faogen 3 installation folder. You can place it in /scripts folder in your 3dsmax location. For correct script operation Faogen should be configured to export per-vertex AO as Vertex Color in Faogen Settings dialog.